Ciao Ragazzi! Vorreste vincere una lezione gratis di cucina italiana? Come?! Partecipate al nostro contest fotografico! Il piatto che riceverà più LIKE sarà il vincitore! Il vincitore parteciperà ad una lezione di cucina di 4 ore in lingua inglese offerta dalla nuova scuola di cucina "Cook in Milano" il 15 Ottobre. Hi Guys! Would you like to win an Italian cooking class for free? How?! Take part in our photographic contest! The dish receiving the most LIKES will be the winner! 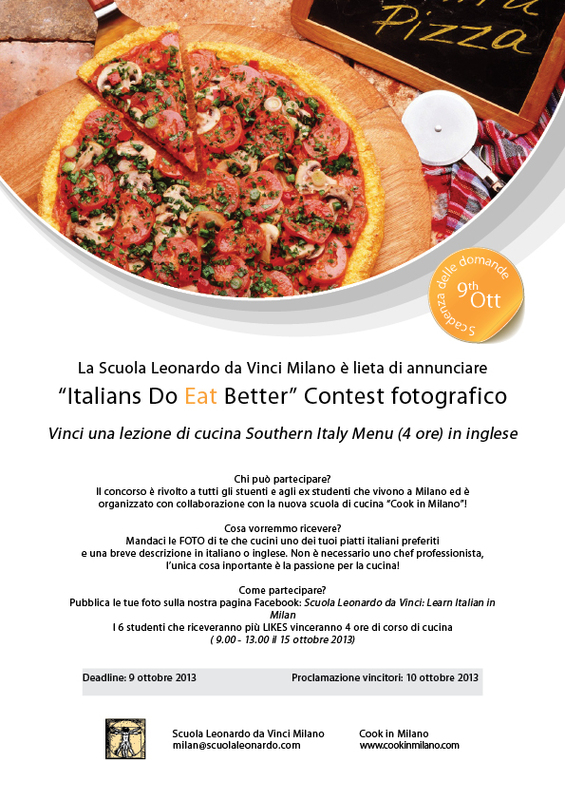 The winner of the contest will participate in a 4 hours Italian cooking lesson in English offered by the new cooking school "Cook in Milano" on October 15th. We'll be waiting to see your creations!